Posted Saturday, Dec 3, 2011 11:50 AM EDT by HAMILTON SPECTATOR & filed under Born. In 1997, Ontario’s health ministry set an unambiguous hard target for reducing the province’s rate of low-birth-weight babies, which was 5.7 per cent at the time. By 2010, the ministry declared, the rate of low-birth-weight babies in Ontario would be reduced to 4 per cent. It’s one of the few hard targets that can be found in provincial government literature about birth outcomes. In 2010, however, the actual low-birth-weight rate in Ontario had risen to 6.5 per cent, according to the results of The Spectator’s massive new BORN project. Thirteen years after the government set its goal, the low-birth-weight rate didn’t come close to the 4 per cent target. In fact, it became substantially worse during a period that saw Ontario’s health budget rise to $44 billion from $17 billion a year. “Clearly there hasn’t even been any close approximation to that 4 per cent happening, ” said Neil Johnston, one of the collaborators on both the BORN project and last year’s landmark Code Red series. 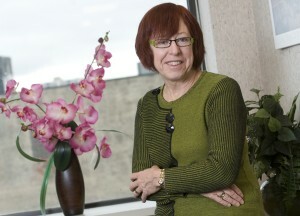 Johnston, an expert in analyzing health data, is also a faculty member in McMasterUniversity’s department of medicine. “What I haven’t seen – and I expect doesn’t exist – is that any structure was put in place to achieve that objective, ” Johnston said. “More to the point, was anybody or any organization or a minister of the Crown or somebody given responsibility for achieving it and given some kind of apparatus to make it happen? “And I’m betting the answer is no. The stubborn persistence in the rate of low-birth-weight babies is more than just a point of provincial shame or a quest for better statistics. Low-birth-weight babies, on average, are an expense for the health-care system – sometimes for life. To get a sense of the costs for just one part of the low-birth-weight equation, here are some rough back-of-the-envelope calculations. Let’s say, for the sake of argument, the province had succeeded in achieving its 4 per cent target last year. That would have meant about 3,370 fewer low-birth-weight babies would have been born in Ontario in 2010. According to an Ontario health promotion ministry document published last year, the average hospital cost for a newborn of healthy birth weight was about $1,000, using Canadian figures from 2005-06. For each low-birth-weight baby, however, the same document estimated the hospital costs for the first year of life would be approximately $88,000. So multiply 3,370 babies by $87,000 per baby that wouldn’t have to be spent and you end up with a potential $295 million in savings for Ontario taxpayers. That’s just for low-birth-weight babies, and just for the first year of life, which is a fraction of the potential costs for low-birth-weight babies to the health care system. An Alberta study has shown premature babies required five times more in direct health costs than full-term babies over the first seven years of life. Yet The Spectator’s BORN project shows the needle continues to move in the wrong direction. “I don’t think there’s a quick fix in this, ” said Johnston. “You have to harmonize all the bits and pieces. What we have right now is a wonderful jam session going on with all kinds of really deeply motivated, committed people, highly skilled in their professions. “What we need is a symphony orchestra, ” he said. Over the past two Saturdays the BORN project has identified unacceptably high rates of low-birth-weight babies across the province, particularly in Ontario communities and neighbourhoods suffering from high levels of poverty. The exhaustive analysis of 535,000 birth outcomes has shown the same is true when it comes to the numbers of teen girls having babies, especially in the north and remote native communities. It’s likewise for the rates of Ontario women receiving the early prenatal care that is vital for putting a pregnancy on the right track. “Ultimately in Ontario, the provincial government has made it very clear that they run the health system, ” said Johnston. “They make the decisions about what the health system will and will not do. “That’s fine. But then they must take accountability for what happens in it. “If we see something like this continuing relatively high level of apparently poor pregnancy outcomes – with a great deal of variation between different neighbourhoods and population centres – then I’d simply like to know who is responsible, ” he added. So just who should be held accountable? With Ontario’s rate of low-birth-weight babies going up, not down, who should be held responsible? Who should be held responsible when one in seven babies in some Hamilton neighbourhoods is born to a teen? Or when the rate of teen moms is as high as 40 per cent on some northern native reserves? Or when nearly half of the pregnant women in a place such as Windsor aren’t receiving prenatal care in the first three months? When it comes to accountability, one of those people is Deb Matthews, Ontario’s health minister for the past two years. “If you’re going to tackle a problem, you first have to understand it, ” said Matthews. “You have to have the data so that you can be strategic in the interventions. Matthews understands this better than most politicians. Outside the political arena, she’s a demographer by training, and she earned a PhD in sociology for an examination of the effects of immigration on Canadian cities over the next 40 years. “We set a goal. We want Ontario to be the healthiest place to grow up and grow old, ” said Matthews. “We’ve got to get to work and figure out what we mean by that, how we’re going to measure that. “We as government, but also we in health care, know that the best thing that we can do for our health care system is actually have healthier people, ” Matthews said. The BORN project has also shown the disturbing level of maternal health problems that exist in First Nations communities, particularly those located on isolated reserves in Ontario’s Far North. Pick almost any marker of social or economic health, and those, too, will likely be abysmal for aboriginals in northern Ontario. Untangling accountability for Ontario’s native population is complex, however. The federal government is responsible for funding First Nations health across Canada but the delivery of the actual health programs is shared between the First Nations themselves and federal and provincial governments. “The government of Canada is very concerned about the gap in health outcomes between First Nations and other Canadians, ” said Health Canada spokesperson Gary Holub. Geographically isolated reserves and “challenging socio-economic conditions” are some of the barriers to delivering comprehensive health services, said Holub. Holub noted some aboriginal health markers have improved in recent years, but infant mortality rates remain approximately twice as high as Canada’s non-native population. The quality of data collected from native communities is also a problem, hindering the government’s ability to measure progress. At the local level, Dr. Chris Mackie is another of those people prepared to be held responsible. He’s a Hamilton associate medical officer of health and he’s blunt in his assessment. “I would hold every level of government and every major institution in our community accountable, ” said Mackie. “We haven’t handled this issue. Mackie said all governments have a role to play in helping solve – or worsen – the health problems affecting mothers and babies. “Are you going to choose policies that create a more supportive and caring society or are you going to choose policies that punish people when they don’t succeed in life?” asked Mackie. The community itself also has to play a role, particularly with teen mothers, according to Debbie Sheehan, director of family health for Hamilton’s public health department. It would be easy, and tempting, to simply blame teen moms – and teen dads – for their predicament, as some commenters on thespec.com boards did when the first BORN instalment was published two weeks ago. That kind of approach, however, does nothing to help the children of these children. “This has to be a grassroots movement where the community supports adolescent mothers, and service providers are there in a supportive capacity but not in the lead, ” said Sheehan. “The community needs to own the moms that live in their community. “If you look at most cultures, with respect to pregnant women, the whole community rallies around from the beginning of the pregnancy right up until that child is of age, ” Sheehan added. “It’s the very top of mind on a lot of fronts. Matthews added: “We’re making targeted investments to improve access to care amongst populations for whom poverty is a reason why they’re not accessing the care they need. “We know that providing primary care, particularly to vulnerable populations, is just the right thing to do. “It’s the right thing to do for the people but it also takes pressure off other parts of our system like our emergency departments. It would be unfair to suggest nothing is being done at a local, provincial or even federal level to improve birth outcomes and maternal health. In response to the outcomes highlighted in the original Code Red series last year, one priority set by Hamilton’s public health department was to develop a community-wide initiative to address maternal health issues. “We know we have to do something different because we have not been successful to date in preventing low birth weight, ” said Sheehan. Meanwhile, a team of McMaster researchers has received federal funding for a one-year study that will look at the factors that could be responsible for variations in the health of pregnant moms and their babies across Hamilton neighbourhoods. At the federal level, Health Canada provides at least $200 million annually to a variety of programs aimed at improving the health of native mothers and children, including nutrition programs, programs to prevent fetal alcohol spectrum disorder births, and the Aboriginal Head Start On Reserve program, which is directed at on-reserve children up to age six. At the Six Nations reserve southwest of Hamilton, for example, pregnant women can take advantage of Ontario’s only aboriginal birthing centre, which offers free 24-hour-a-day support. Home visits are part of the program, and pregnant women can even receive some medications, such as iron supplements. The centre’s logo – four generations of women with a grandmother moon shining down – is painted on the wall and built into the floor as a tiled mosaic. “For us, it takes a whole community to raise a child, ” said Julie Wilson, supervisor of the centre. Six Nations also offers a Healthy Babies, Healthy Children program for families. At the provincial level, Ontario has put into a place a strategy with the goal of reducing by 25 per cent the number of children living in poverty by 2013. The province has also set a goal of reducing child obesity by 20 per cent. “It’s something I am absolutely committed to and passionate about, ” said Matthews, the health minister. “We’re all better off when all our children are better off. “Health is closely linked to their ability to eat nutritious food or to have stability in their housing, ” she added. “Taking financial pressure off families is good for the health of kids and they’ll do better in school. Healthy birth weight is one of the eight indicators being tracked as part of the poverty reduction strategy. “We think it’s an important indicator because it talks about the health of the mom and it also talks about the health of the child, ” said Matthews. “If people finish high school, they’re less likely to become teenage moms, we know that. “People who go on to university are less likely to be teenage moms. “But is that the causal factor? It’s probably part of it. But I think it’s earlier than that. “It’s whether that person has hope or not, whether the person believes they can achieve their goals, and that’s determined earlier. Much earlier – maybe even in the first two years of life in many cases. “If you don’t have that foundation, that belief that you’re valuable as a person, which is really established in those first two years, then you’re a lot less likely to go on and achieve something in elementary school. “And if you don’t achieve something in elementary school, chances are you’re not going to achieve something in high school. Corrado Gini was an Italian statistician and demographer with a particular interest in the economics of large populations. In 1912, he came up with a mathematical formula that has since been linked to his name – the Gini coefficient. While the formula is complicated, the concept is simple. The Gini coefficient is a number between 0 and 1 that represents the income inequality that exists across a group of people. In a hypothetical population where every single person had the exact same income, the Gini coefficient would be 0. A place where one person had all the income and everyone else had none would have a Gini coefficient of 1. Most of the time, the Gini coefficient is used to rank countries. At one extreme is Namibia, the country with the greatest income inequality in the world and a Gini coefficient of 0.71. At the other extreme, the country with the least income inequality, perhaps not surprisingly, is Sweden, with a Gini coefficient of 0.23. Canada’s coefficient is 0.32, which is 35th-best in the world. Meanwhile, there are only 43 countries in the world worse than the United States, which has a coefficient of 0.45. But Gini coefficients can also be derived at a much smaller level than countries. 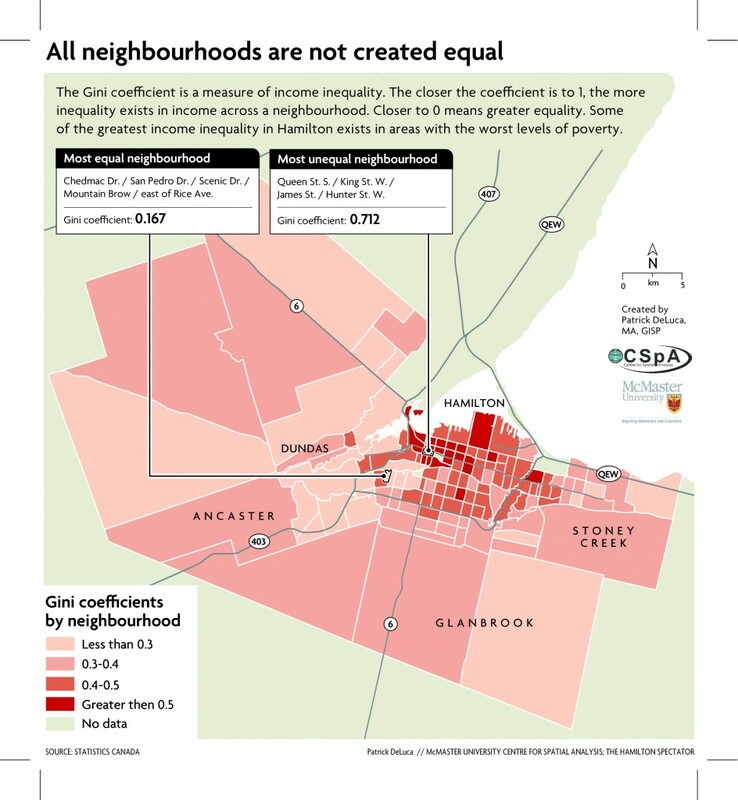 It turns out the Hamilton neighbourhoods with the greatest income inequality are also the same neighbourhoods with the highest levels of poverty. 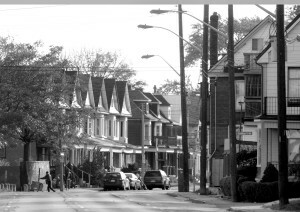 Twenty of the 22 neighbourhoods with the highest income inequality are located in the lower inner city, centred in the heart of Hamilton’s downtown. 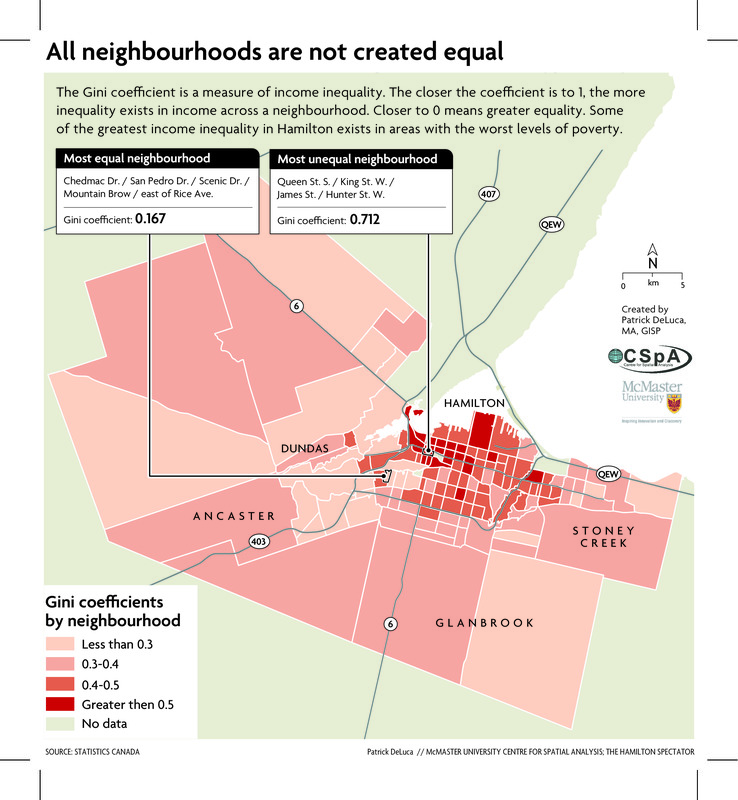 The neighbourhood with the highest income inequality – from Queen Street to James Street between King Street and Hunter Street – has a Gini coefficient of 0.71, the same as Namibia. This same neighbourhood was among the 10 worst in Hamilton for a number of health factors, based on last year’s Code Red findings. Its median household income was less than $19,000 according to the last census, almost half of the people there lived below the poverty line and about one-quarter of the neighbourhood’s income came from government handouts. Meanwhile, the neighbourhood with the lowest income inequality – on the west Mountain along the brow by Scenic Drive – had a Gini coefficient of 0.17, more equal than Sweden. In that neighbourhood, the median household income was nearly $136,000 and there were no people living below the poverty line according to the last census. Look around the Golden Horseshoe and compare numbers. Hamilton’s Gini coefficient is 0.424. For Burlington, it’s 0.334. For Oakville, one of Canada’s wealthiest communities and a place where teen mothers are almost nonexistent (as BORN showed), the Gini coefficient is even better at 0.286. Why is this important? Because the health and social effects of income inequality are coming under greater worldwide scrutiny by academics. Backed by hundreds of scientifically conducted studies, the evidence now suggests that the greater the income inequality across a group of people, the worse the outcomes are for any number of health and social factors. And not just for those at the bottom of the ladder, but for everyone across the group. Perhaps it’s a coincidence the Hamilton neighbourhoods with the greatest income inequality also happen to be the neighbourhoods that performed poorly for any number of health variables based on the findings of both Code Red and BORN. Perhaps it’s not a coincidence. 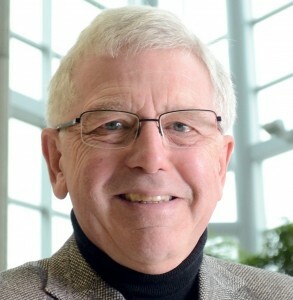 Terry Cooke is president and CEO of the Hamilton Community Foundation, the city’s most powerful philanthropic organization. 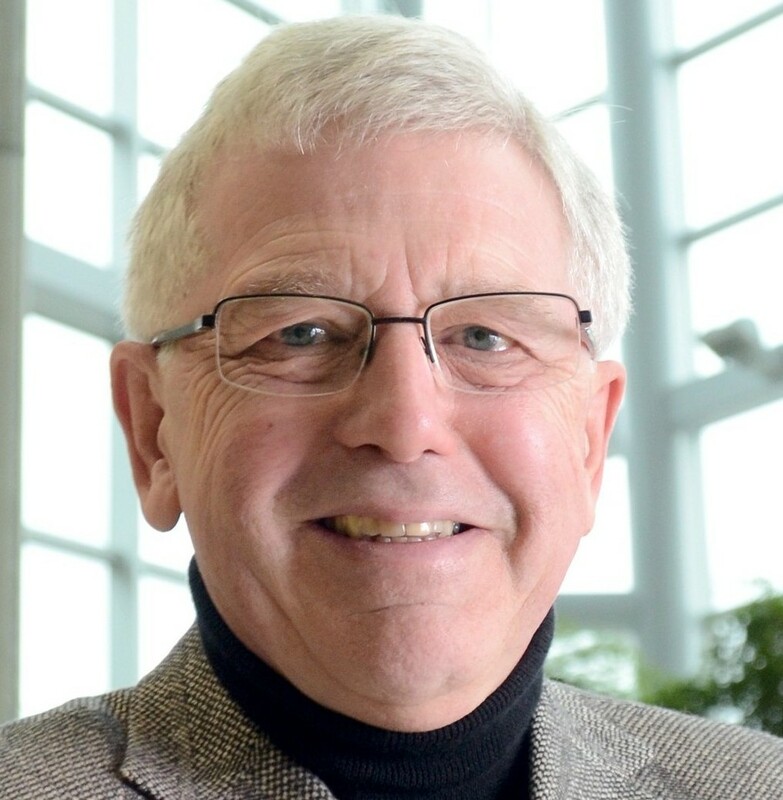 He’s also a former Hamilton councillor and regional chairman. So he understands from more than one angle the politics and challenges of city building. “It diminishes assets and compounds problems in concentrated areas, ” said Cooke. In the 19 months since Code Red was published, Cooke said he can see momentum building thanks to collaborations that have brought together public agencies, academic institutions and citizens’ groups. “I think the pendulum is moving, and in some ways the public is starting to understand that we need some fundamental changes and that will require leadership both at a grass-roots neighbourhood level but also at a political level. Ontario’s rate of teen mothers between 2006 and 2010 was 3.7 per cent. For low-birth-weight babies, the rate was 6.5 per cent. About 85 per cent of pregnant women in the province receive prenatal care in the first trimester. Are those numbers good? Bad? Better or worse than expected? It’s impossible to know because there are no hard targets when it comes to these types of health outcomes. Check the Ontario Public Health Standards, which govern the mandatory programs that are the responsibility of public health units, and you won’t find specific targets listed. Same for the province’s 71-page Reproductive Health Guidance Document, which was published last year. Instead, there are any number of generic recommendations to increase awareness or reduce rates or improve behaviours for certain outcomes. It raises a debate about the effectiveness of setting actual quantifiable goals in the provision of health programs. “Hard targets focus public attention … which tends to shake up government, ” said Lea Caragata, a WilfridLaurierUniversity professor of social work. “And even without that, hard targets give bureaucrats – the people on the ground doing the work – something to focus on. New Zealand’s Ministry of Health, for example, publishes an entire Internet-based section on health targets that must be met by the country’s 20 district health boards, including an interactive spreadsheet that can be downloaded showing the performance of each board for the various targets. In 1997, Ontario’s health ministry did set a hard target of reducing the province’s low-birth-weight rate to 4 per cent by 2010. Instead, the rate actually worsened over the 13 years, the deadline passed and there were apparently no consequences for failing to meet the objective. Ontario Health Minister Deb Matthews suggests the issue is more a question of semantics. “Whether you set an aspirational target or you look for movement in the right direction, I wouldn’t call that a profound difference of opinion, ” said Matthews. “I think it’s good to set targets, ” she added. “I also think it’s important to report on progress toward those targets or lack of progress. At the federal level, the issue of hard targets becomes more complicated. The federal government provides health funding for First Nations, but the specific method of providing health programs can be a collaboration between the First Nations themselves and the federal and provincial governments. We have a choice in Ontario. We can wait for health and social problems to build up over a lifetime, sometimes right from birth, and then spend a lot of money at the back end trying to fix broken people – with varying degrees of success. Or we can spend some money upfront to prevent people from becoming broken in the first place, and then reap far bigger savings later. 1 Expand Hamilton’s Nurse-Family Partnership pilot program to the entire province. The program matches a high-risk, low-income first-time mother with a nurse who conducts intensive home visits prior to birth and until the child reaches two years of age. The goal is to get mother and child on the right path for the long term. “It’s really one of the gold-standard programs anywhere in the world in terms of effectiveness, of really demonstrated effectiveness, of clear goals and clear expectations, ” said Debbie Sheehan, director of family health for Hamilton’s public health department. Better yet, expand the program so it’s open to more than just first-time mothers. 2 Aggressively strive to cut the smoking rate among pregnant women. Smoking is a known risk factor for low-birth-weight babies. It’s estimated up to 30 per cent of low-birth-weight babies could be the result of mothers who smoke during pregnancy. It has also long been known that smoking rates increase as incomes decrease. At Hamilton’s Maternity Centre, which helps hundreds of at-risk and low-income pregnant women each year, about one in four expectant mothers smoke. In Thunder Bay, about 30 per cent of pregnant women smoke. 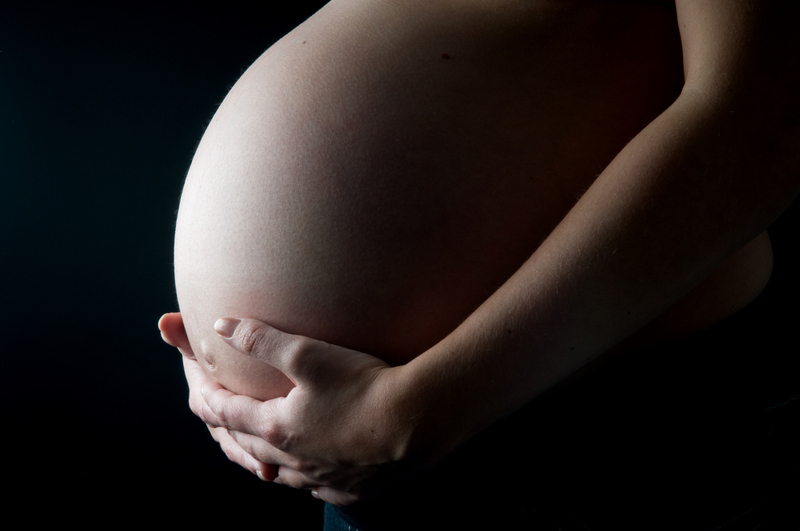 For pregnant aboriginal women, the rate is even higher – nearly half are smokers. Choking off the supply of cheap cigarettes on native reserves would be a good first step, for the health both of natives and non-natives. 3 Improve access to early prenatal care, particularly in at-risk neighbourhoods, through the use of incentives. Early access to prenatal care is an important factor in healthy birth outcomes. The Spectator’s BORN project shows about one in six pregnant women across Ontario is not receiving prenatal care during the first trimester. The data also shows that lower rates of early prenatal care are associated with neighbourhoods that have lower incomes. The incentives could be direct, in the form of financial compensation, or indirect, in the form of merchandise and food vouchers. The costs are meagre compared to the lifetime cost of poor pregnancy outcomes to the health care and education systems. 4 Move aggressively to cut the rate of births to teen mothers through a targeted, co-ordinated approach that combines the efforts of public health, school boards and social agencies. The Spectator’s analysis shows a clear connection between low income and poor educational achievements and higher rates of teen mothers across the province. Children of teen mothers have a higher risk of being high-school dropouts, being unemployed and being teen parents themselves, so stopping the cycle is vital. The differences in the rates of teen pregnancies and teen births between wealthy communities and poor ones are staggering. It’s easy to see where resources need to be directed. Particular attention needs to be focused on Ontario’s native communities. 5 Set quantifiable, publicly available targets for birth outcomes and maternal health markers in Ontario, make someone somewhere accountable for them and impose consequences when the targets aren’t met. “Hard targets are useful if anyone knows that there are hard targets and pays attention to them, ” said Lea Caragata, a professor of social work at WilfridLaurierUniversity. 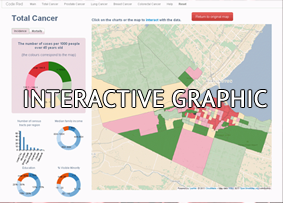 Ontario’s 14 Local Health Integration Networks all have a long list of performance targets they’re expected to meet – from wait times for cancer surgery and hip replacements to the percentage of elderly patients waiting for placement in a long-term care facility. Surely, targets can be set for something as important and costly as the rate of low-birth-weight babies or the rate of teen mothers in Ontario. When Benjamin Franklin first used the expression “an ounce of prevention is worth a pound of cure, ” it’s unlikely he could have contemplated its awful certainty in the consequences of poor birth outcomes and compromised early childhood development – consequences that include poor educational achievement, an increased likelihood of criminal behaviour and a greater chance of young parenthood. There is no magic formula that will guarantee to every child a life with no wants and perfect health, but it is in the interests of us all to provide every child born in Ontario with the best possible chance of lifetime health and the ability to learn. It is also natural justice. Effective prenatal care including good maternal nutrition, avoidance of stress and fetal exposure to harmful substances, provision of effective medical and nursing care, along with a well-managed birth, are more likely than not to improve the chances that healthy children will be born. Continuing care and support through the early childhood period builds on that foundation. In this series, it has been shown that higher rates of births to teenage mothers and poor pregnancy outcomes are skewed toward communities where poverty is most common. This probably does not come as a surprise to any of us, although the degree to which it occurs may. Nor is it an original observation. But need we wait for the elimination of poverty to occur to see if pregnancy outcomes improve? Reducing the likelihood of poor pregnancy outcomes in Ontario is an achievable goal. Pregnancies without prenatal care, and births to teenage mothers with inadequate nurturing of children in infancy impose massive costs on our health, social service and education systems. Avoidance of these costs, apart from any humanitarian motive, should provide the incentive to innovate. We hold that all people are created as equals, and we make strident efforts to maintain a single health system for all. However, people are not equal in their ability to make wise choices in healthy behaviours and to decide when they need to obtain health care, whether for themselves or their children. When the lifetime health of children is a consequence, we have an obligation to do everything in our power to foster the inclusion of pregnant women and the children they bear in comprehensive care through the prenatal and early childhood periods. That requires us to challenge those responsible for our health care system to face reality and create a system for child health with success measured by improved pregnancy outcomes and measures of child health – with explicit accountability in place for their achievement. Let’s start with co-ordination of care. Pregnancy outcomes are so important to our society that investment in their success is required. Health care co-ordinated through one person has been shown to eliminate many of the difficulties associated with the incoherence of care that is typical in our health system. So let us appoint a care co-ordinator – a personal champion – for each pregnant woman who requests one or who is found to be exposed to risk factors. Let us eliminate the barriers to care access for pregnant women – exorbitant health-care-facility parking fees, cab fares, care of other children, threatening behaviour of partners and others – through pragmatic management reinforced by law when necessary. Financial poverty underlies many pregnancies with poor outcomes; let us provide financial and other benefits without prejudice to women to help draw them into this unified system of care. Unfortunately, the health of children is sometimes entrusted to parents who are incapable of sustaining it. Our current approaches to intervention when a child’s welfare requires it may also require scrutiny to identify opportunities for improved coherence of care and integration with a redesigned and unified approach to children’s health. In so doing, our threshold for tolerance of bureaucratic moat-building should be very low. One of the toughest challenges in health care is ensuring people comply with their care plans. Inevitably, visits will be missed and promises broken. That will require a change in orientation from passive to active in-care delivery so women can be brought back into the system. It will require those responsible to create a system that adapts and evolves as factors associated with success and failure are understood. I do not suggest the care provided to the majority of pregnant women now is not adequate. It is, and delivers excellent results, but a minority of pregnant women need something more. Canada’s future belongs to its children and we are all their trustees. Their birthright is good health, and there is no excuse for any of them to be denied it because we are not prepared to intervene. If we don’t, we will all bear the costs. But the children we don’t help will pay the steepest price. Neil Johnston is a faculty member in McMaster University’s department of medicine and a collaborator for both The Spectator’s Code Red and BORN projects. The very words “poor pregnancy outcomes” separate the world into haves and have-nots. This is so for many women in less-industrialized countries, but here in Canada, too, pregnancy often just happens. It is not planned and no one is thinking about what a “good outcome” would really mean because the choices that seem available are so very limited. People with some level of education and privilege tend to think pregnancies should be planned. That the would-be parents should understand and fully accept the consequences of pregnancy – perhaps including the lifetime demands of being a parent. In the case of early or teen pregnancy, additional consequences can include the loss of educational and social opportunities and the potential costs to a child of having very young – and often poorer – parents. Such assumptions rest on an unstated premise that if these young people weren’t parenting early, they would enjoy other life-enhancing opportunities. As Canada’s index of inequality and income disparity increase, the presence of these life-enhancing opportunities is simply absent for many young Canadians. Consider the rate of joblessness among young people, which stands at more than 14 per cent. That statistic is made up of two very different groups – young people with credentials including postsecondary education, and young people who may not have finished high school. Imagine then what the job opportunities are for those with fewer skills and credentials who may also face other barriers such as poor communication skills and a lack of the social capital that connect so many of us to jobs and opportunities. For many of these young people, it doesn’t make much difference to their available opportunities if they have a child at 18 or 22 or even 25. It might make a difference to the child, of course, but only if in these intervening years something was going to occur in these would-be parents’ lives that would provide more education, skills and economic security. Even just an opportunity to grow up helps make for better parents, but this too assumes that such growing occurs in a context of positive role models and some level of safety and security. In 2001, American policy scholar Christopher Jencks wrote a provocative essay, Do Poor Women Have The Right To Bear Children? Jencks argues that as our increasingly market-oriented views suggest that no one should have children who cannot adequately support them, we must confront the uncomfortable reality that the current system leaves some people out. Its very structure accepts 14 per cent as an acceptable level of youth unemployment, and even more distressingly accepts that such unemployment is more likely concentrated in poor neighbourhoods, among immigrants and visible minorities, among aboriginal people and those with disabilities. What follows from our current social structuring is that if some people struggle to get let in, others will be forced out in their place. That is the reality of chronic high unemployment and increasing economic inequality. Hence Jencks’ title, which suggests for an increasing number of citizens, their right to become parents hinges on a shift in our thinking: to recognize and accept the structural nature of their dependence, or to change it. How do we do that? Education has long been acknowledged as a bridge out of poverty. Programs such as Pathways to Education have demonstrated a model that seems to work. Canada spends less on education than the average among Organization for Economic Co-operation and Development countries. In fact, we place 24th out of 39 OECD countries on education spending as a percentage of our gross domestic product. We have allowed our labour market to shift away from good, high-value jobs to a place where almost a third of our labour force is in what is called “precarious work” – low-paying, part-time, no benefits and no job security. Our federal and provincial governments need to get a message that we care about structural inequality, that we want good jobs and real opportunities for all Canadians. We need to challenge the rhetoric that these issues are not the responsibility of government but those of individuals and markets. Good public policy could once again make us a fairer, safer, more equitable country – but only if citizens demand it. Perhaps those who are part of the Occupy movement need others to stand with them. The equality of opportunity that was a democratic cornerstone of our society has faded from our consciousness, allowing many young people and families no real options beyond their current lives of significant material and social deprivation. Children born in such households, too, will likely face more hardships than their richer counterparts and are more likely to struggle in school, have babies while in their teens, without supportive and committed partners and without the means to economically sustain themselves and their children. Lea Caragata is a professor in the faculty of social work at Wilfrid Laurier University. I have had the privilege of visiting many young and vulnerable families in their homes during my 25 years in public health, and they have taught me a lot. These young women often face social isolation and adversity, and frequently have no positive parenting role models. Without support early in life, many of the children of these mothers will not succeed in school, will have mental health problems and will participate in risky behaviours. This often leads to chronic dependence on welfare, drugs and alcohol, and high rates of disease that burden the individual and the health care system. We can and must change this potential negative trajectory. Here are some of the key things I have learned from the adolescent mothers I visited. They often feel they are collectively labelled and judged negatively just for being teen mothers. They want to be recognized for their individual accomplishments. Few plan to get pregnant but they all feel it is important that they accept responsibility for their infants. Almost without exception, they want to be the best mother possible. They often experience feelings of loneliness and isolation as a result of living on their own. Some are lucky enough to have the continued support of their families, but many do not. Continuing their education is a key factor in being economically self-sufficient versus being dependent on social assistance. School boards and other agencies in Hamilton recognize this and have implemented many excellent programs to assist young mothers in returning to school as soon as possible after having their babies. However, many of these adolescents have high levels of stress and frustration, particularly in the evening when they are tired and trying to complete their school homework. Imagine what it would be like to have a crying baby night after night with no one to help. Unfortunately many adolescents have experiences where individuals – complete strangers, even – make negative comments to them. They feel that people, including service providers, are often not willing to look beyond the fact they are adolescent single mothers, and that there is no recognition that they are trying to succeed. Becoming a mother at a young age brings profound changes in interpersonal relations with peers and family, often resulting in isolation and lack of support. In spite of the many hardships they face, these adolescent mothers have a sense of optimism regarding their future. They have the same aspirations as most of us: to some day marry, have a job, have a family. We need an immediate commitment in Ontario to reducing the geographic inequities that the BORN series has identified. We must focus on providing evidence-based programs to improve the negative impacts of the social determinants of health on vulnerable pregnant women and their families. Child poverty rates in Ontario are alarmingly high, and have not improved despite significant attention. Hamilton’s unique Nurse-Family Partnership is one of the few programs that has been proven to break the intergenerational cycle of poverty. The NFP is a home-support program that focuses on young, low-income, first-time pregnant women. It consists of a series of home visits starting during pregnancy and continuing through the child’s second birthday. Frequent visits allow a strong partnership between the nurse and mother, providing a unique type of caring and support. Studies have shown that the program helps stabilize the lives of these young, at-risk mothers and improves the lives of their children. It is cost-effective with a payback better than $5 for every $1 invested, and is based on the philosophy that changing lives is not about a handout, but helping people become self-sufficient. Effective prevention efforts that focus on eliminating teen pregnancy are also important. But just ensuring access to contraception and abstinence counselling is not enough due to the complex issues that many of these adolescents face. We also need a system of services that is consistent across the province. This will require a willingness for government ministries to truly work together and to be open to transformational change. In a just society, we would say that health and social inequities, particularly for children, are unacceptable. This will require a long-term change in our society, from one that places the onus on the individual parent to one where each child is considered a sacred gift to us all. This means that government and employers must develop and implement family-friendly policies specifically designed to ensure a stable and nurturing environment for all children. It is our collective responsibility to ensure every child in Ontario has the best possible start in life. Debbie Sheehan is director of family health for Hamilton’s public health department.